Controls above the LCD panel: Multiple exposure button, Static/Dynamic AF ([+]), Exposure mode selector, Exposure compensation (+/-), Shutter release with locking power switch, and the front control dial. Left of the LCD: Meter pattern selector, viewfinder diopter adjustment. Body and construction. The F5 was Nikon's last flagship camera of the film era and many of the first commercial digital cameras were built on the F5 body. As you'd expect from an F-series camera it's solid, reliable and fast. It's weather-resistant; I've used it in blizzards and light rain with no ill effects. It's the first Nikon with a dual control wheel and other interface elements still used by current digital cameras: ISO and mode buttons, the focus point selector switch, the meter pattern selector, 10-pin accessory port, and the drive selector. The body has a built-in vertical grip with a second shutter release, but lacks a second set of of control wheels found on modern battery grips. 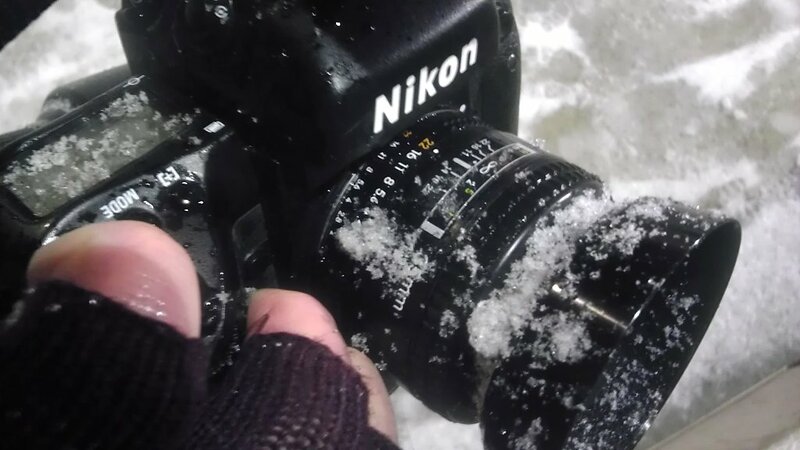 As a Nikon digital user I felt at home with the F5 very quickly. Power. 8 AA batteries! Lithium batteries are lighter and last me for at least 50 rolls. Motor drive. The built-in motor drive can do up to 7 frames per second on high speed (CH). That's a little over 5 seconds to chew through a 36 exposure roll. Rewind is fast, too, but requires two hands to get it going: you must hold down a release button and flip a lever. Autofocus. There are only five autofocus points. The biggest drawback is not that there are only five, but that they don't light up. The top LCD shows which point is active if you can't tell when looking through the finder. There is a dedicated AF-ON button but release-priority (true back button focus) isn't enabled by default. Autofocus speed is similar to my D800 but it feels like the F5's AF motor can whip screw-drive lenses into focus even faster. Modes are Manual, Single and Continuous. There's also normal or dynamic AF, which can track moving subjects across sensors. I don't shoot sports much, but it seems to work very well. Viewfinder. The viewfinder is wonderful: large, clear and free from distractions. 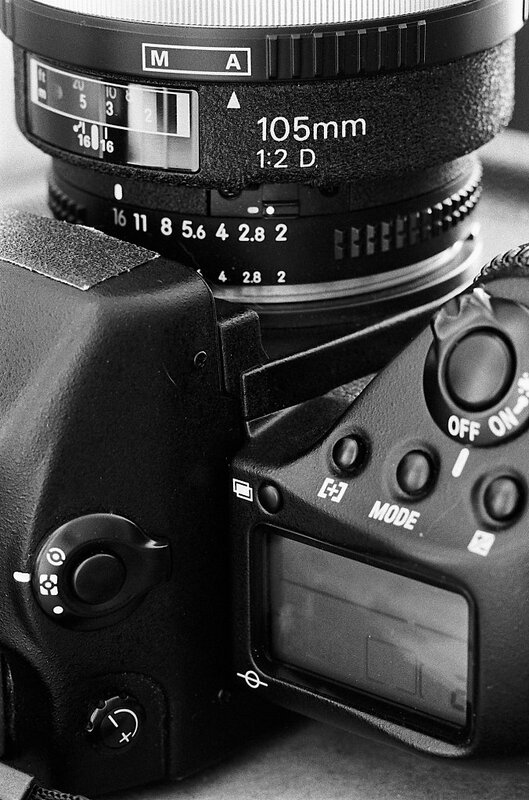 There is a digital rangefinder that works with manual focus lenses. The pentaprism is removable and even though it's supposedly weather-sealed dust gets in. Focusing screens are replaceable but only the stock EC-B screen displays active AF point. Secondary controls. 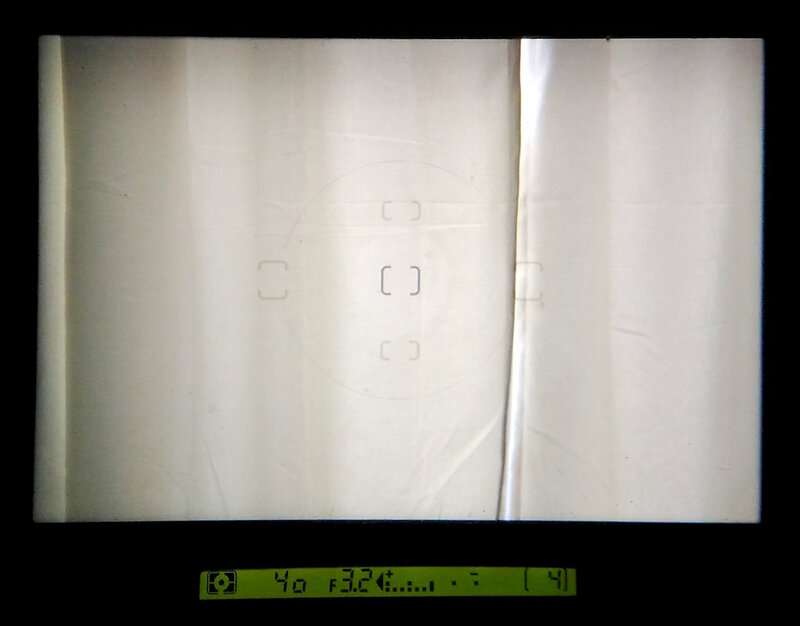 There's a small LCD and panel on the back of the camera with lesser-used controls to manually set ISO, enable bracketing, select flash mode and set custom functions. Flash. No built-in flash. Not compatible with current Nikon i-TTL flash. I found a used SB-27 for under $30 which is small and powerful. The unexpected. My F5 developed a problem where it kept "forgetting" it had film in it mid-roll more and more frequently. The frame counter would show E, and I'd lose 3 frames mid-roll when it advanced to the "first" frame. This eventually happened so often it became unusable. I sent it off to Nikon fully expecting that they wouldn't be able to fix it. They did, in under a week! The camera stores exposure information which can be downloaded and merged with scanned photos via a Meta35 dongle and software. Meta35 also simplifies setting custom functions. The bottom line. I usually have a 35mm f/2.0 AF-D lens on this beast, and while it's heavy it's manageable. I find using it is intuitive, and it just works. I have an F100 which is lighter, has illuminated AF points, and is in most ways similar to the F5. Still, I usually reach for the F5 instead. Metering seems to be a bit better than the F100.